The other day, a friend of mine shared an article from NPR on Facebook that really struck a chord with me. The article basically pointed out just how impressive all the technology around us is. And yet, we do not even notice. In fact the only time we seem to notice it is when something goes wrong, like if our phone takes more than a second to load. As the author (and Louis CK) say, it is literally being sent to space, and yet we complain. This article, and the video that accompanied it, was a real wakeup to me. I sit and type or browse the web or edit photos or whatever on my laptop but I never reflect on it. Seriously, here is a three pound piece of metal and glass that let’s me chat with someone across the country in the blink of an eye. That is absolutely amazing. If someone showed up with a MacBook Pro in the dark ages, they might have even labeled it witchcraft. I definitely do not agree with Louis CK calling us the “crappiest generation” but he is absolutely right that we are spoiled. I certainly do not think of the decades of technological research and meteorology that went into allowing me to check the weather on my phone in seconds. In fact, I do not even think about the hours that are spend everyday to ensure that I can stay up to date with the weather, or whatever peaks my curiosity. It is quite upsetting to hear older generations gripe about how we are all spoiled narcissists. But, in my subjective opinion, the same thing could have happened to any generation. Technology’s great advances in the beginning of our lifetimes have programmed us, as Rushkoff might say, to act like we do. We do not just use technology; it uses us and it’s great convenience and speed has taught us to expect instant gratification. In my opinion, the effects of this have not just affected our generation. I see my father, who is in his fifties, get anxious if his email takes a moment too long to load. And I see my mother, for all of her patience, lose her head if she doesn’t have cell phone reception to make a call. Maybe it’s just human nature to get so accustomed to technology that we don’t notice it. I suppose my point is that we need to appreciate technology more. Maybe if we do, we can avoid our generation’s theoretical fate of self-absorption and narcissism. As Twitter continues to grow and gain new users, Facebook feels as if it is being left behind. 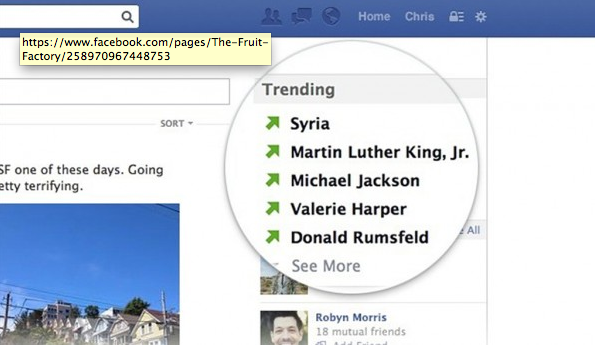 In order for them to keep up with the competition, Facebook will launch “Trending” on their site. Facebook has recently decided to add a new feature to their site called “Trending” which mostly aims at trying to get more users involved in real-time information and events that are trending on the web; just like Twitters trending topics. This new feature on Facebook main focus, is to allow public conversations to happen between many people on important or popular topics that may be surfacing the web. Facebook wants to expand the way users interact and allow them to have conversations with other people rather than just their friends. Facebook users will be able to see what other people think about a certain topic or their reaction to important events happening in the world. Recently, Facebook signed a partnership with NBC sports to cover the Olympics. NBC’s Olympics’ Facebook page will have content regarding the event. It will share the most important information, videos, photos, and polls. Also, Facebook users will be given the opportunity to their own questions to Sarah Hughes, an Olympic god medalist. Although Facebook is creating this new “trend”to increase its new users and be more attracting for the younger audiences, current Facebook members are not using the site as much as they did before. With all the new apps created such as Twitter, Instagram, and Snapchat, users do not need to log into their Facebook pages to see what their friends are doing. This new idea hopefully revives Facebook and it will be interesting to see if Facebook users begin to use Facebook for “Trending” topics rather than Twitter. Microsoft’s Windows Phone crew posted a long advertisement on YouTube that takes a punch at Apple and the two new types of iPhones that the company released last week. The video is called “a fly on the wall in Cuptertino.” If you watch the interesting video above, it shows two fake Apple employees (that are rumored to depict look-a-likes of the real Apple CEO and vice President, Tim Cook and Jony Ive). This commercial is different from the commercials that Windows usually makes when poking fun at iOS and Android cell phones. In the video, the person who the two employees are pitching their ideas to looks just like Steve Jobs. In the video, it shows the two workers calling the iPhone 5c phones fancy colored names (saying “vermillion,” when it is just pink and “chartreuse” for green). The commercial makes fun of the fact that it took Apple 6 months to create the idea of coming out multi-colored phones. The commercial then moves on to attack Apple yet again after saying that they created the newer phones out of plastic to save money. The man jokes and says that the company will not tell the customers that they are actually made out of plastic. Another memorable joke that they use against Apple is regarding the fact that the new iPhone 5s can not come in gold. The man says, “everyone likes gold, pirates, leprechauns and this guy (a random hairy-chested man, which I did not understand why it was meant to be funny). The video closes with a black backdrop and the hashtag “#timetoswitch” (implying the idea that consumers need to switch from IPhone to the Windows products). In my opinion, I think the real reason they removed the video is because they realized from all of the negative comments and feedback from viewers that the video was very poor in creating a funny or good attack at Apple. We all know that these two are really competitive companies, so I expected a lot more from Microsoft. Although the company took it down, the parody commercial still lives on. I was reading the YouTube comments and one comment that got many likes on the site simply said, “lamest ad ever!” I agree that this was a bad move on Microsoft because they look really stupid at trying to come up with an attack on iPhone and then failed miserably at creating it. If anything, it just makes Apple look better!